Elizabeth Goreham presides over her final meeting as State College mayor on Jan. 2, 2018. As State College welcomed a new mayor on Monday, the borough saw the tenures of two long-serving officials come to an end. 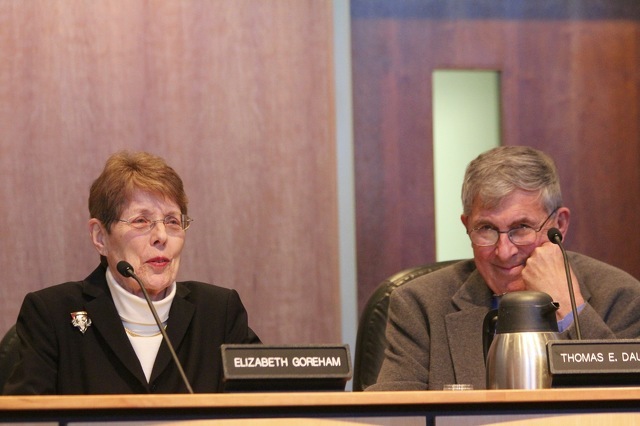 Former Mayor Elizabeth Goreham and former borough council President Tom Daubert took part in their final council meetings in their elected roles. Goreham leaves office after eight years as mayor, preceded by 12 years on council, while Daubert served a total of 24 years on council. "All I want to say is thank you to the citizens of State College," said Goreham, who presided over her final meeting before her successor, Don Hahn, was sworn in. "Over these past two decades I have met thousands of State College residents working to make our town a better place for everyone. I discovered what community means. It’s very special in State College." 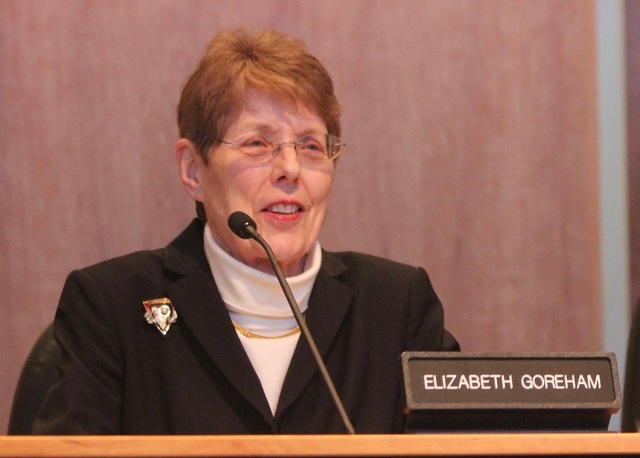 Goreham moved to State College in 1993 with her husband, Jack Matson, and soon after was elected to her first term on borough council, eventually serving as council president for two years. Following the death of four-term mayor Bill Welch, she became State College's first elected female mayor in 2009 and was re-elected in 2013. She announced in February that she would not seek a third term. Beginning with her time on council and continuing through her two terms as mayor, Goreham was an advocate for sustainability measures, diversity, neighborhood preservation, entrepreneurial efforts and marriage equality. She also took on an active role as State College's representative to the Pennsylvania Municipal League and worked to build relationships between the borough and Penn State administrators and students . "Next door our world-class university is an essential part of our town," she said. "Almost everyone has a positive connection to Penn State, which brings us diversity of people and new ideas, and students eager to implement them. To me, that’s what makes this Happy Valley." Daubert noted the borough's mayor has two major duties -- presiding over borough council meetings and acting as the official representative of the borough. "Mayor Goreham has broadened her service in many different ways than have past mayors," said Daubert, whose time as an elected official overlapped almost entirely with Goreham's. "As mayor her forte has been sustainability. She advocates in all areas of this important effort. She has been at the forefront of all mayoral efforts I can remember and I’ve been through three mayors here, even performing marriages in cases where [she] led the way." Hahn, who received Goreham's endorsement during this year's campaign, said her advocacy has been inspiring. "She has been great. She’s been an advocate for neighborhood preservation and a very active advocate for sustainability, diversity and entrepreneurship," Hahn said. "I think she certainly has been ready and willing to take the mayor’s office to more activist and sometimes controversial grounds. I don’t think I’m going to be as controversial but I certainly wish to emulate her activism." Goreham said there is "no higher honor" than having been elected to represent her fellow citizens and said she will miss the borough staff. She plans to remain active in the community. "Above all I’m looking forward to being an active citizen, especially in areas of my highest commitment -- sustainability and diversity," she said. "In State College, democracy works when the citizens speak out. You make me very proud when you do and I hope to see you here a lot, along with me." Daubert, meanwhile, has had a long record of service on council. First taking office in 1992, he served four terms before going off council in 2008 and 2009 when limits of two consecutive terms were put in place. He once again was elected to consecutive terms in 2009 and 2013. During his time on council he was council president three times. "I learned an awful lot doing this and it’s been a real pleasure to serve the borough of State College, to do what I think is best for the borough," he said. "I’ve enjoyed every minute of it. I’ve enjoyed working with the staff. It’s a pleasure to come in here. I really appreciate what the staff does. They are doing a wonderful job for the borough of State College." Daubert was instrumental in planning of the current State College Municipal Building, which opened in 2001, and has served on a variety of boards and commissions over the years. He's also been very active with regional government, serving as chair of the Centre Region Council of Governments and advocating for regional parks and pools. He will continue to work with the committee for the regional parks plan, and was appointed to the borough's Board of Health. "I was reminded when I was thinking about what to say that Winston Churchill said 'Nothing great is ever achieved without enthusiasm,'" council member Catherine Dauler said. "I think, Tom, you have demonstrated enthusiasm and dedication to the community. Your decisions reflect considering the well-being of the entire community and that’s very important. You are, in my mind and the minds of others, what it means to be a true servant leader." Daubert said he will be working on an addition to former Mayor Arnold Addison's book "Issues and Personalities in the First 100 Years of State College Government," which was published around the borough's centennial in 1996. Addison talked to Daubert in 1999 about updating the book, but Addison passed away the following year. "But I’ve always thought that when it was time, I wanted to do it," Daubert said. "I’m in the process right now of starting a monograph which won’t be taking his book and changing it. It will be an addition to his book rather than a replacement. I think that’s going to keep me busy and keep me interested in what’s going on in the borough." Borough Manager Tom Fountaine said the departure of Goreham and Daubert was meaningful to him personally because they, along with Dauler, were the only remaining members from council when he first started in his position. "It certainly makes our jobs a lot easier to have elected officials like Tom and Elizabeth," Fountaine said. Council member Evan Myers, who was elected to succeed Daubert as council president, said Goreham and Daubert are mentors and friends. "They both contributed a long record of service to State College and the Centre Region," he said. "We all know they are not finished yet. They have much more to contribute. They both helped and mentored me personally and I appreciate their friendship." 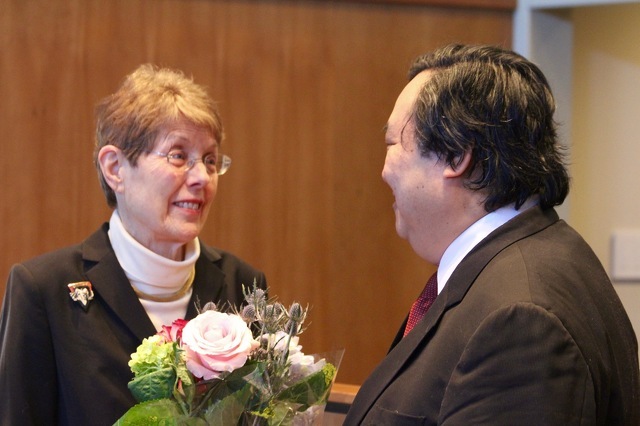 Elizabeth Goreham received flowers from her successor, Don Hahn, at her final council meeting as mayor. Photo by Geoff Rushton/StateCollege.com. Penn State hockey will open the second half of the season this weekend against Wisconsin ranked No. 15 in the latest USCHO.com national poll and No.12 in the PairWise rankings. 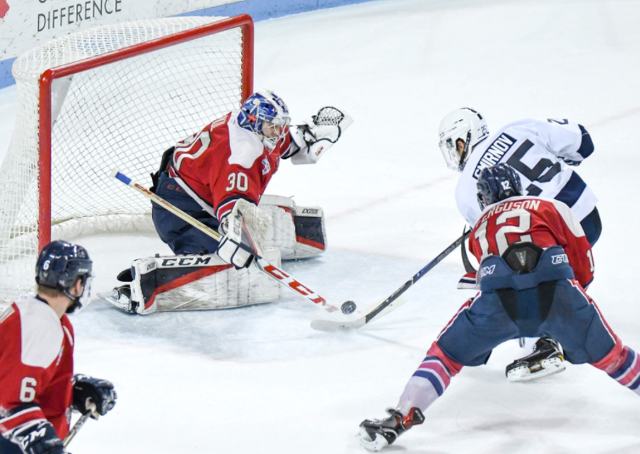 The Nittany Lions are 6-0-2 in their last eight games and most recently swept Robert Morris almost a month ago in a series that took place at PPG Paints Arena in Pittsburgh and back in State College at Pegula Ice Arena.